Renters: Wouldn’t it be nice to walk into a rental home before the movers, household goods, and chaos arrive to find a complete, thorough, and explanatory collection of information to ease into the mystery of the new house? Homeowners and landlords-to-be, take note; not only will these ideas lessen your renters’ worries, you’ll save a lot of back-and-forth communication time, because the answers will be neatly arranged right in front of them. Manuals. The more the better. Seriously. The sump pump upkeep won’t be obvious, nor will the brand and item number for the refrigerator water filter. Paperwork for garage door openers, washer and dryer, and carbon monoxide detectors are very good reference materials to have on hand for tenants. List of trusted vendors and/or home warranty policy. Phone numbers for plumbers, HVAC, lawn care, and handymen in addition to others needed to make your home run smoothly will be helpful additions. Have pre-established account numbers listed. Communication information to reach the homeowner. Cell phone, home phone, emails, work numbers, spouse’s contact information, and possibly your address are all potentially needed in case of emergencies. Choose which work best for you and leave them clearly available in the binder. Upkeep schedule. Renters won’t know when the ducts have last been cleaned or when the furnace filters have been changed. A month-to-month guide providing home upkeep chores will mitigate big problems like pipes bursting in January. A descriptive list of paint. If you require tenants to do touch-ups before move out, list the paint colors and cans in an obvious way so they have no trouble deciphering between latte and cappuccino brown for the living room. Tricks of the house. Every house has a couple of quirks that are best to be embraced and worked around. Demonstrate the unique lock system on the doors or show the exact shimmy needed to open the finicky windows. Most importantly, always remind renters NOTHING goes in the toilet except for T.P.! A picture of the location of main water turn off/on. This is pretty obvious, but major water damage can be minimized if the location is well known. List of trusted neighbors. If they are willing, phone numbers and addresses of neighbors who would be there to help out in a pinch are useful. Neighborhood information. 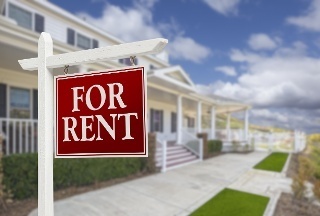 Such as the local pool membership (if included in rent), neighborhood associations, or other groups of people that are relevant to the home and renters. Keys. Not just for the front door, but to the shed, mailbox, or any other lock that will need to be accessed. As a landlord, you don’t want to overwhelm renters with too many details of the house that aren’t their responsibility, so pick points that are important to your mental health and ask they refer to the binder every so often to stay ahead of the needed upkeep in the home. 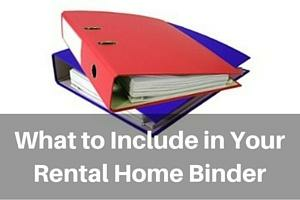 Click below to download rental home binder tips in a quick list format!